"These make for a great side dish. They are spicy and crispy yet fluffy in the middle. They go with everything." Mix paprika, olive oil, garlic powder, chili powder, salt, and black pepper together in a bowl until marinade is smooth. Place potatoes in a baking dish; add marinade and rub into potatoes. 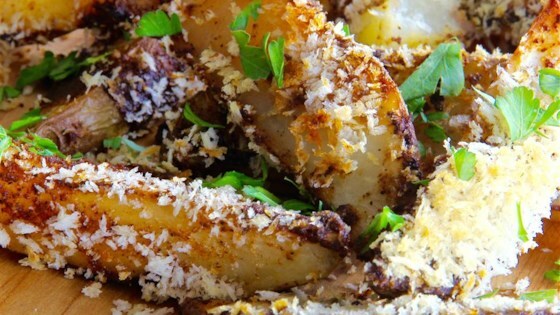 Sprinkle bread crumbs over potatoes and coat each wedge well. Bake in the preheated oven for 30 minutes. Reduce heat to 355 degrees F (180 degrees C) and continue cooking until wedges are tender enough to puncture with a fork, about 30 minutes more. An easy, delicious way to enjoy leftover mashed potatoes for breakfast or dinner. It was a good side dish. However next time I might use less bread crumbs as well as less salt. A bit overpowering but I would try and make this again! The flavor of these was very good but they did not get crisp at all. The bread crumbs did not stick very well. Made it according to instructions how ever, next time I will leave out half the garlic. Personal preference. Other than that, very good side dish.